A roster of events and happenings leading up to the People’s Climate March mobilization in New York City. Poster designed by Josh MacPhee. You may have heard that what is expected to be the largest rally for an environmental cause in US history is happening this Sunday, September 21, in Manhattan. More than 100,000 people are planning to join a historic march for climate action two days before President Obama and world leaders attend a Climate Summit at the United Nations. In Europe and Australia growing numbers of people are joining the Fossil Free divestment movement. In Asia and Africa groups are organizing for a new development paradigm powered by renewable, community-based energy, not coal. In Latin America communities are resisting fracking and the vested interests opposing progress on climate change. And in the Pacific, nonviolent warriors are rising up to blockade the largest coal port in the world. Now activists in the US are calling on America to get with the program. The march begins at 11:30 am at 59th Street, Columbus Circle. The front of the march is expected to reach the end of the route at about 2 pm. At the end of the day, in keeping with the day’s emphasis on inspiration and resilience, a massive climate block party on Eleventh Avenue between 34th Street and 38th Streets will commence. At the center of the close will be a massive tree installation created by Brooklyn-based artist Swoon. Get all the info you need about Sunday’s events and how you can get involved at the People’s Climate site. There are also a host of actions, events, educational events and protests being planned across New York City this weekend. The good folks at The New School are hosting a climate action week featuring not just Naomi Klein’s US book launch but also a diverse set of programming directed towards the university and wider community showcasing the creativity, solidarity and collective action of the growing climate movement, and highlighting the New School’s longtime committment to supporting climate justice and action. Check out the offerings. On Saturday, September 20 at 8 pm, the All Souls Unitarian Church in Manhattan will host a forum on the way forward in fighting climate change with Senator Bernie Sanders, Naomi Klein, Kshama Sawant, Bill McKibben and Chris Hedges. My colleague Muna Mire has been researching the more grassroots events of the week and suggests taking part in these ten actions over the next few days. 4) Rockaway Climate Justice Bash! 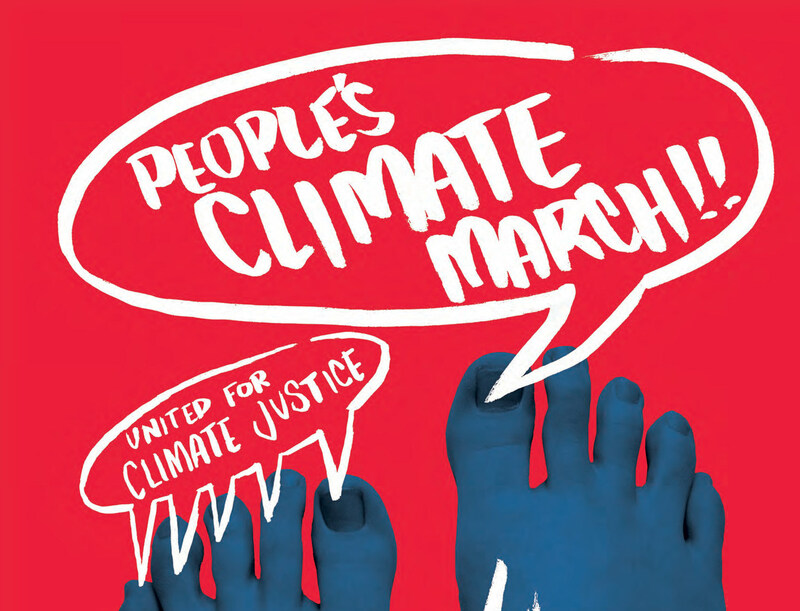 If you’re not in NYC this weekend, there’s an open-source action to provide people around the world who can’t be at a march in person with an easy way to show solidarity and join the masses in telling world leaders it’s time to #walkthewalk on climate change. Post a video of yourself walking wherever you are and say why you #walkthewalk on climate change. Personal testimony can be a powerful organizing tool. Organizers will be pulling in the video content in real time to create a virtual march experience living across social media. It’s also useful to click here to tell President Obama and Special Envoy for Climate Change Todd Stern to support the goal of 100 percent clean energy by 2050 at the Climate Summit. Whatever you do this weekend, do something!